Introducing 10 exclusive 3&4 bedroom townhouses designed for a life of ease. Each modern and stylish residence flows over two levels and is surrounded by landscaped paths with direct connectivity to the Town Centre. 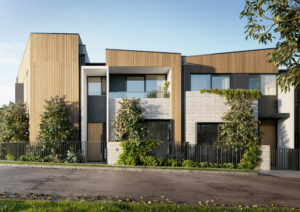 From the first vantage point outside, the townhouses reveal themselves with external timber-look cladding, double glazed windows, evocative of the ever- popular and stylish Scandinavian style. Once inside, the feature timber joinery continues, alongside grey natural stone benchtops, chrome tapware and the all-important feature island bench that life so often revolves around. Award winning architecture and interior design firm, Clarke Hopkins Clarke, has drawn upon their 50-plus years of design experience to create Eclipse Townhouses. There’s an ease of life at Eclipse – the immediate surroundings are outstanding from childcare on the doorstep to the nearby shopping centre, restaurants, cafes, a supermarket and additional services. The latest release, Eclipse townhouses add to the thriving Polaris 3083 community, which is currently home to 750 residences, with plans and permits for further 100+ residences in the near future.